PerryPie's Nail Polish Adventures: SpaRitual Can You Dig It? 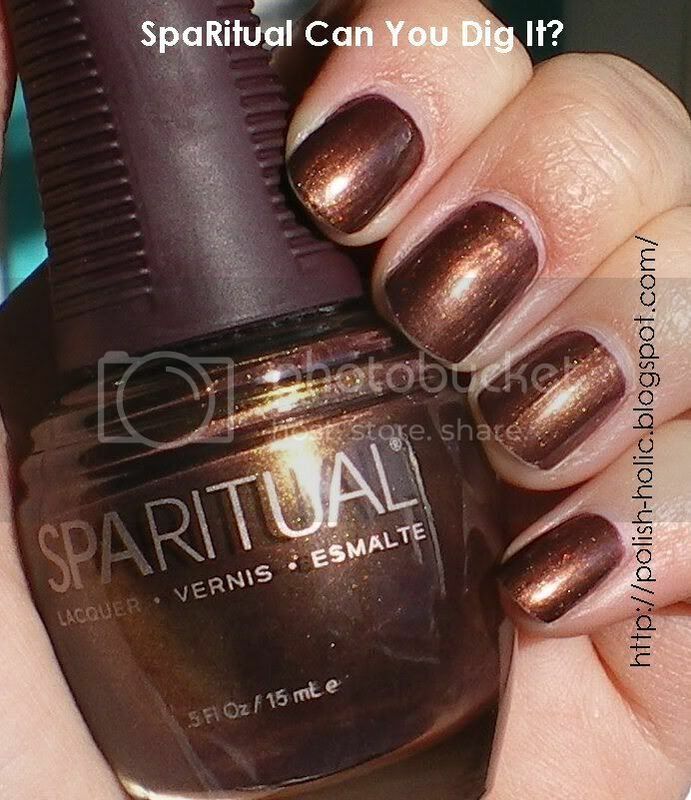 This is the first SpaRitual polish I've ever worn. Very exciting. 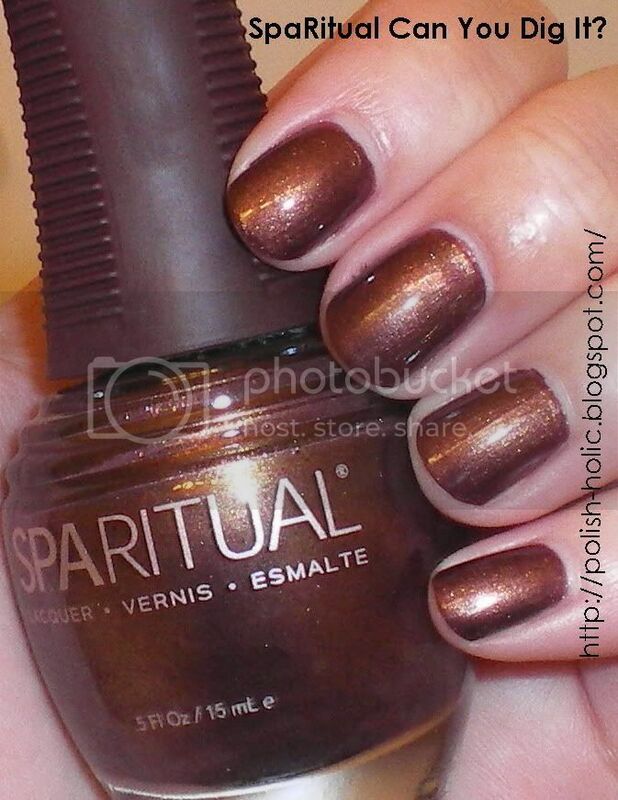 SpaRitual is a very special brand of nail polish. It's a completely vegan polish which has no animal products, does not use synthetic dyes and all plants used in their products are wildcrafted or organic. From the little brochure that my polish came with wildcrafted means "plants are carefully harvested from their natural habitat to ensure that the remaining wild crop will thrive" and organic means "plants are grown without synthetic fertilizers or pesticides." The bottles are also 50% recycled glass. I like the way all of this sounds. Now onto the colour and performance. Can You Dig It? is a purple-based golden brown shimmer. I really love the colour. It's got great depth and is just lovely to look at. I took more pictures than usual to try and capture the colour but I just couldn't manage it. This is about as close as I got. It's a little bit darker than these flash pics. This is two coats. I actually found the formula a bit thick, but it goes on smooth. The brush itself is shorter than most, which allows for good control, so the slightly thicker formula doesn't pose a huge problem. 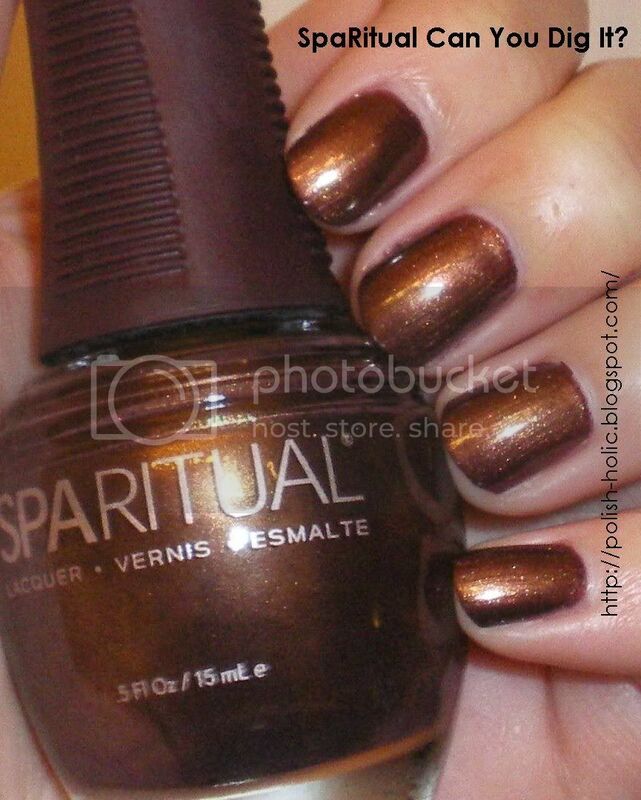 This is opaque in one coat but requires two to look like the bottle. In the first coat it actually looks really purple-brown with gold shimmer. I tried to take a picture at one coat to show y'alls but you can't really see how purple it happened to be. Along the edges of my nails you can see the hints of purple. Overall, I would say the polish could be thinned a little, but for something this pigmented, I understand why it's so thick. One thing I'm really surprised about is the smell. It smells a lot like my old non-3-free OPI polishes. Not as strong, but it has the same odour. Very surprising considering the formula. I really love the idea of SpaRitual's eco-friendly mandate and I have every intention of trying more. But holy shat are they ever hard to get a hold of. There is one salon in Calgary that sells them and at $13.90 each. So I totally went online for them instead. On the internet, they're availabe in the US at www.skinstore.com and in Canada at www.spaboutique.ca. And if you're Canadian but don't want to go online, go to www.sparitual.com send them an email and they are very accommodating about getting you in touch with your local SpaRitual distributor who will let you know what stores in your area sells SpaRituals. That's how I found out about the one store in Calgary. I hope this ridiculously long entry was hopeful for you guys. Edit: One last picture for you. It looks just like the others, but I figure since I had it, you might as well see it. This pic is a wee bit lighter. 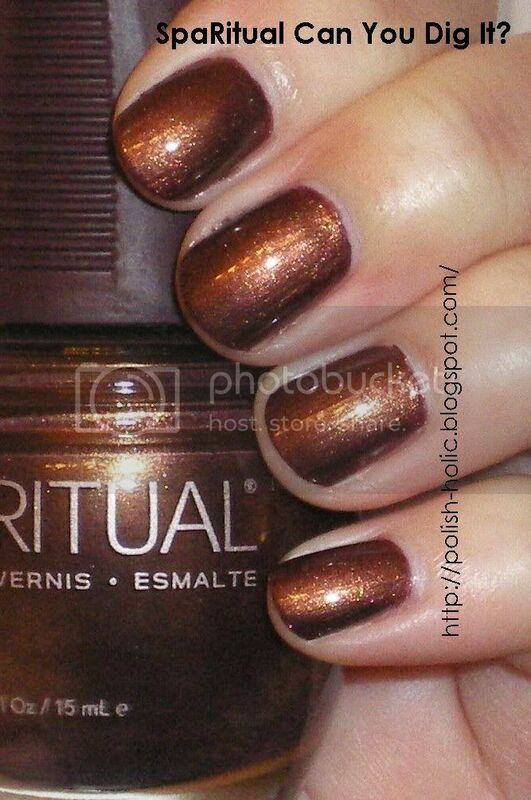 Like I was saying to PolishPig, I really love how it's all dark at the edges and is light in the middle. Really great depth. Edit 2: Sunlight pic! Ignore the tip wear, it took a few days to get some sunlight. I totally agree, a little thick and not the easyest to apply, funny smell but a very interesting shine that really mades the colour special. Thanks for the suggestion! I will definitely give them a try. And yes, the shine is amazing on this one. It has that dark on the edges, bright in the middle look which I love. So much depth.